After most people wake up, they head straight to the kitchen to make a cup of hot coffee, or drink a cold cup of water. 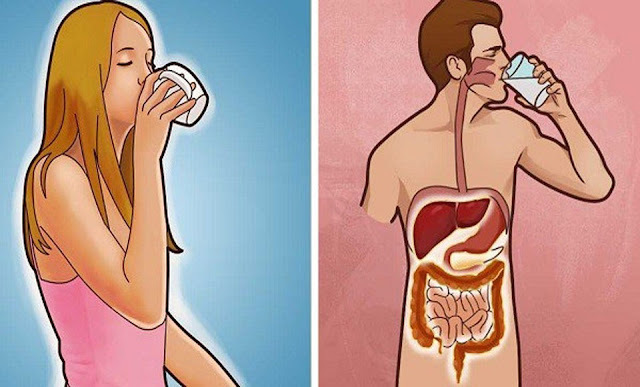 However, to get the most benefits of drinking liquid in the morning you should meet these popular morning beverages halfway and drink a warm cup of water instead. Drinking warm water first thing in the morning can provide you with numerous health benefits and is one of the best ways for you to start your day off right. Drinking warm water can help soothe dry, irritated or swollen throats. Warm water will reduce the swelling in the throat and help to temporarily relieve pain. This helps during those mornings when you wake up with a dry throat and it hurts to swallow. You will notice a reduction in pain almost immediately after taking the first sip. Warm water relaxes the muscles of the stomach and soothes any cramps. Drinking warm water has been shown to help aid in digestion any time of day. According to a study conducted by the Journal of Neurogastroenterology and Motility, a group of patients who suffered from achalasia (a condition in which the muscles of the lower part of the esophagus fail to relax, preventing food from passing into the stomach) drank warm water to see how it would help them. According to the study, 58% of the patients showed a significant improvement in their condition after drinking the hot water. Drinking a glass of warm water in the morning before eating will help activate the colon to move your bowels more easily. It also prepares your body for best absorption of food throughout the day. Drinking warm water can also help enhance the blood flow in your body’s circulatory system. According to this study, when the human body is exposed to warm temperature, blood cell flow increases by a dramatic amount when first introduced. It then declines back to a normal rate of blood flow and begins to slowly increase the longer it is exposed to heat. Drinking warm water can help improve your circulation by warming up your body from the inside. Drinking cold water when you’re feeling hot on a hot summer day may feel heavenly. It helps you to cool down within seconds, but I bet you never thought about what cold water does to your body (as opposed to warm water). When you drink cold water, your body has to expend energy to warm up the water in order to use it. Cold water constricts blood vessels, thus reducing hydration and its absorbability. Drinking cold water solidifies the fats in your food, causing your body to have to work harder in digesting the food. Cold water creates excess mucus in your respiratory system. When your lungs get congested, you are more susceptible to various infections and chances of a throat infection are higher. This short video clip will give you something to think about, the next time you reach out for a glass of cold/iced water.